One of the things I like about cemeteries is the art that can be found and the symbols which are used. The stone of Ruth Carter is one of my favorites. I like this stone for a few reasons. First is just the age of the stone. This is one of the oldest (but by no means the oldest) at the Old Granary Burying Ground in Boston, MA. There is a wonderful carving of flowers and an urn across the top of the stone. But the thing that really strikes me is the skeletons on the sides of the stone. 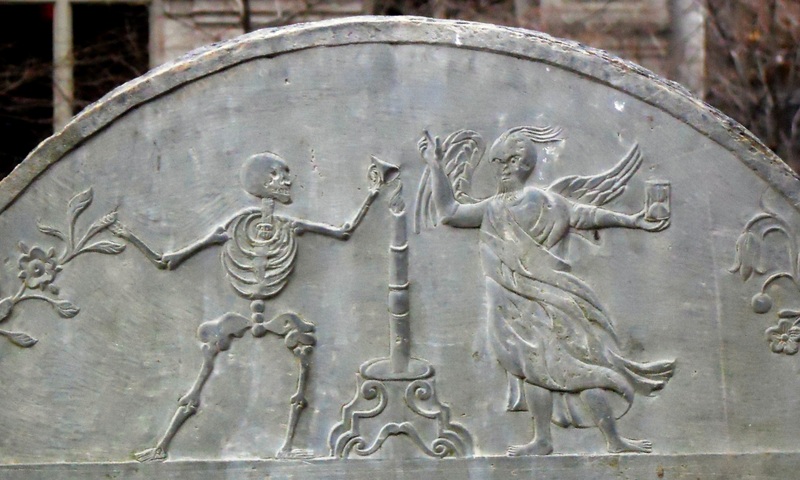 Skeletons were used on gravestones to symbolize life’s brevity. Here we see two different skeletons on the stone. The one on the left looks like he is smiling, while the one on the right appears sad. Also notice the year of Ruth’s death. It is carved as 1697/8. This is not a mistake. The old Julian calendar was replaced by the more accurate Gregorian calendar in 1582. However, the British Empire did not recognize the change until 1752. When they did begin using the new Gregorian calendar, the first day of the year changed from March 1 to January 1. Therefore, any dates between January 1 and March 1 of any year between 1582 and 1752 would be represented by showing a “double year”, one for the old calendar and one for the new calendar. So Ruth died on January 26 1697 by the old Julian calendar, but January 26 1698 according to the new Gregorian calendar. Symbolism is prevalent on gravestones. This image is one of my favorites (so much so that I used it as the banner for this blog) because of the symbols and the wonderful carving. In this image, we see Death, represented by a skeleton, trying to extinguish the candle of life. On the opposite side of the candle is Father Time, hourglass in hand, attempting to prevent Death from putting out the candle. 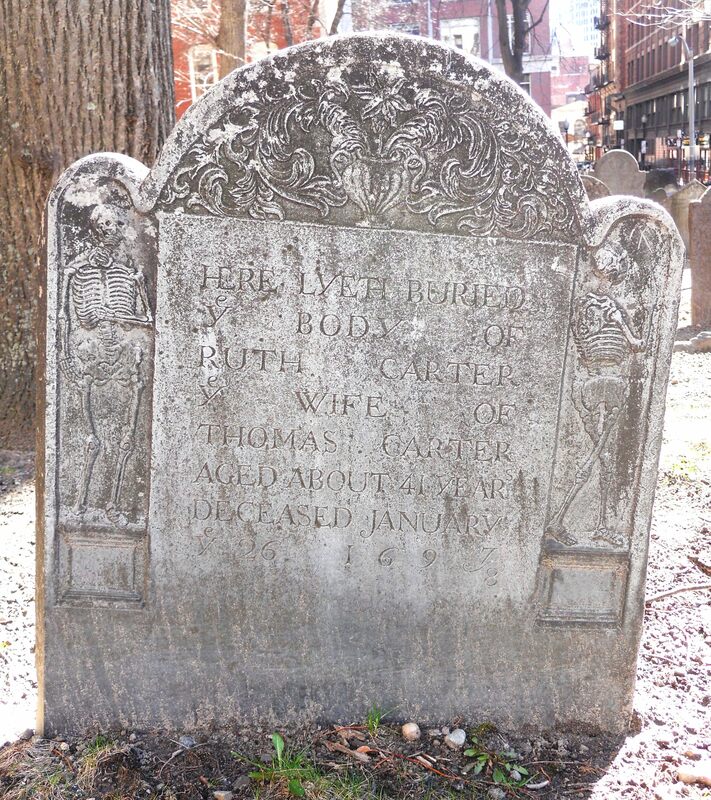 This wonderful carving is on the gravestone of Rebecca Gerrish, located at King’s Chapel Burying Ground in Boston.